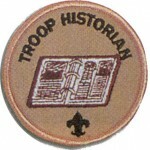 The Historian keeps a historical record for the troop. The historian preserves troop photographs, news stories, trophies, flags, scrapbooks, awards, and other memorabilia. Gathers pictures and facts about troop activities and keeps them in a historical file or scrapbook. Takes care of troop/team trophies, ribbons, and souvenirs of troop/team activities. Keeps information about former members of the troop/team. Provides a brief write-up and pictures for at least 75% of troup outings and noteworthy activities to the Troop Web Master Assistant for posting to the Troop website. For outings that they cannot attend, they make alternate arrangements with the ASPL for someone else to take pictures and create the write-up. Serving as Troop Historian can apply towards positions of responsibility requirements for Star, Life, and Eagle. There is no minimum rank for this position.